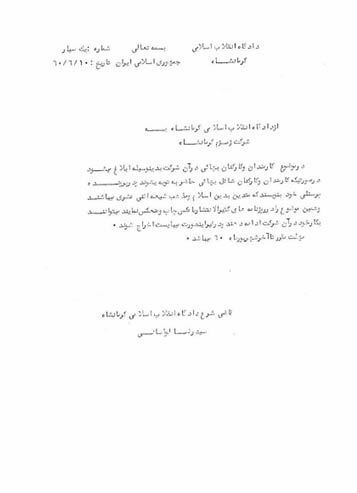 In this document dated Shahrivar 1360 [September 1981], Seyyed Reza Lavasani, the appointed judge of the Islamic Revolutionary Court of Kermanshah, orders Zamzam Company of Kermanshah to dismiss Bahá’í employees and staff, unless they repent and introduce themselves as having Faith in the Twelver Shi‘a sect of Islam and publish this testimony with photographs in Iranian newspapers with wide circulation. The company is given less than 3 weeks to implement the order. Concerning the Bahá’í workers and employees in that company, it is hereby declared, that if the Bahá’í workers and employees are willing to repent, and record in their personnel files that they are followers of Islam and the Twelver Shiate sect, and publish and reflect this fact in the widely circulated newspapers of the country along with their photograph, they can continue their employment in that company. Otherwise, they must be expelled. The deadline is end of Shahrivar of 1360 (22 September 1981).